I was reading an article on author Tobias Buckell's views on eBook piracy a couple of days ago and was struck by a couple of key paragraphs where he refers to compulsive collectors who have the urge to collect but not necessarily read. "Consider hoarders. These are pirates who literally attempt to find every single book online that they can. These pirates are well documented. They’re obsessive collectors, list makers, compelled by something other than a love of literature." I could really relate to that paragraph and I started to think about how some aspies with OCD comorbids like myself and people with general obsessive compulsive disorders could get themselves into a lot of trouble over internet piracy - for the wrong reasons. Some time ago I bought a CD from Corel. 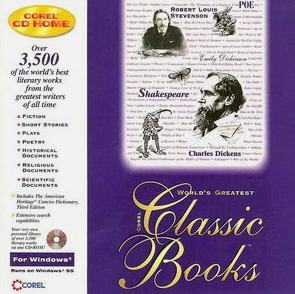 It was called World's Greatest Classic Books and it had "over 3,500" books in Envoy (.EVY) format which was at one time being positioned as a competitor to PDF. I never actually read any of those books because I couldn't get comfortable reading large amounts of text on a PC Screen. I've since gotten myself a cheap eBook reader (a MiGear) which cost half the price of the cheapest Kindle and is colour too. It's comfortable enough that I can read books on it. I took two weeks holiday recently. It's the longest holiday I've taken in years. One week we spent on a cruise (the less said about that the better, though you can read the first two parts of the story here and here). The rest of the time I spent at home. I'm not the sort of person who can spend time at home without getting at least a few projects done but not all of them make sense. In this case, one of the projects I completed was the conversion of those 3500+ books to PDF format to use on my reader. It wasn't an easy conversion by any means. I had to open each book up, print it to PDF Format and rename it. All of the files were similarly named (eg: EBOOK00042.EVY) so I renamed all of them to reflect their author and title. I also arranged them into folders based on their author. It was a lot of work and I'm still not sure whether I'll read those particular books but I feel good that the job has been done. Some I definitely won't bother with but at least I have them and at least they're categorised and in order. It's an impulse that I have little control over but I feel better now. They don’t actually read the author’s work, they just want the book to have it. Many online pirates have tens of thousands of books or more. They’re not reading them. They’re scratching some other itch. (**an author I'd never heard of before this and maybe I'll read one of his books - or maybe not). Hi, my name is Sarah and I am also an Aspie. I am just now in the beginning stages of self-acceptance and it really helps to know that I am not alone. I really liked reading your blog and can't wait to read more from you. I have a 2 year old daughter who just turned 2 back in back in November. Thankfully, she hasn't shown any signs of Asperger's Syndrome, and I hope she never develops it. I also have a blog to, if you want to check it out...http://www.inthishecticlife.com I am going to follow your blog because I like the material you put in it and I need to find more friends who are going through what I am going through everyday. I can really relate to what you write. In my case it is both books and music, most the later. I actually show an effort to read and listen tö what i get but time wont permit that ofc. Its also ocd thing of owning or having. Thanks for the blog btw. I once got a cease and desist letter from, I think, the Motion Picture Association of America and a record label and what not and got my Internet account temporarily suspended. I've had my wake-up calls. I no longer do any of that, but I can certainly relate to this blog post. But it's interesting. I'm currently watching every season and episode ever made of a series called Boston Legal, on YouTube. It appears that a couple of people have curated it, but changed the tonal pitch slightly to evade copyright laws. This is great because I don't own a TV anymore, nor do I have cable, just 3Mbps DSL and Netflix. Between that and my chromecast and YouTube I am happy enough nowadays. It was very very hard for me, but I distroyed my old collection, which was consuming my life, turned the page and am now living a new chapter in my life. Therapy and medication also helped me get over that hump. I'm glad. It can certainly become parasitic to one's life and can even ruin relationships.